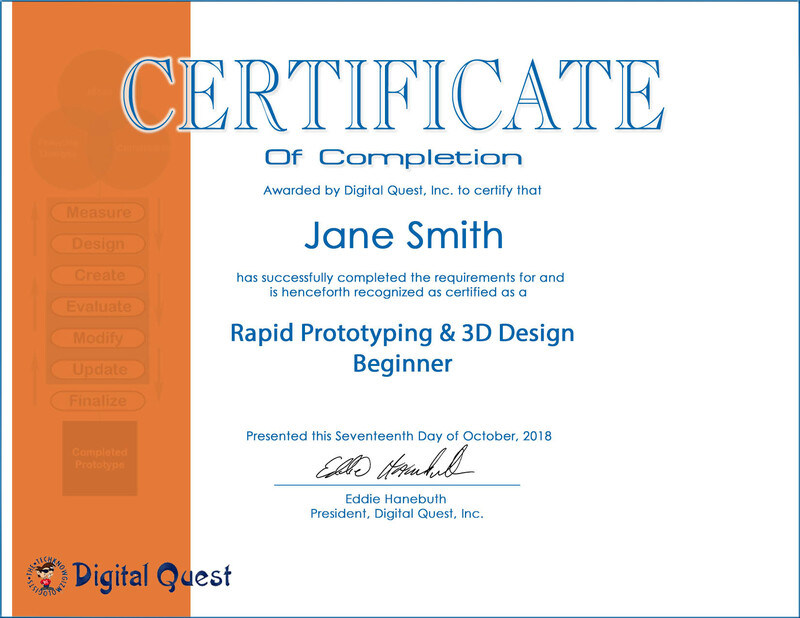 An approved Florida Digital Tool Certificate for the 2018-2019 school year, the "Rapid Prototyping & 3D Design Beginner" Certification is based on CAD and 3D Printing for tomorrow's workforce. Add this certification anywhere you would explore SolidWorks or Inventor or 3D Printing. Digital literacy on this topic is crucial as the industry impact of those technologies now have implications in design, engineering, healthcare, fashion, manufacturing, and more. Two-Thirds of Manufacturers are using 3D printing with another 25% intending to add the technology. This certificate aims to measure a student’s ability to demonstrate introductory CAD literacy as well as introductory 3D skills. Signup to receive more information, study guides, & updates! A Florida Digital Tools Certificate for middle school students looking to demonstrate CAD Design and prototyping knowledge. 3. Which of the following is an additive process to create a 3-dimensional part from Inventor? 4. How much would a 2”x 2” x 2” cube would weigh when 3D printed in ABS plastic?